1. Click the ‘Admin’ icon. 2. Click the ‘Renewals’ icon. 3. 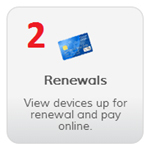 Tick the checkbox next to the device you would like to renew. Click the ‘Renew & Pay’ button. Enter your billing information and follow the on-screen prompts. This entry was posted in Renewals on March 17, 2014 by .